That’s what Aunt M wanted when she was settled in at the rehab facility to night. Egg drop soup. Since she’d eaten little more than grapes today, I rushed out to get her soup. I’m living proof misophonia is a thing. (Click the link. Its eye opening) It’s worse since my TBI because I have a reduced threshold for extraneous or otherwise superfluous sounds in general. I’m typing at Starbucks right now, sitting under a speaker in the corner of the store and yet the barista laughing and dropping the F bomb while she takes out the trash behind the counter? Is on my last ear-nerve. Anyhow. Sounds stress me out. I manage, but sometimes its not without effort. I’m also a sympathy puker and have an insanely weak gagger. Not being able to smell has reduced the frequency of spontaneous eruptions of mount vomitius, but for a long time a smell or the sight of something gross made me gag. And then there’s texture. And body fluids. Two of my favorite Littles (looking at you NWT and MMT) pushed me over the edge more than once with an explosive sneeze or an indescribable diaper when Aunt Jennie was new at being Aunt Jennie. I sure love ’em, though. Then there’s food. Without the sense of taste and smell, texture is everything in a meal these days. Its hard to imagine, but I have a vivid imagination, too. My mind actively paints pictures. 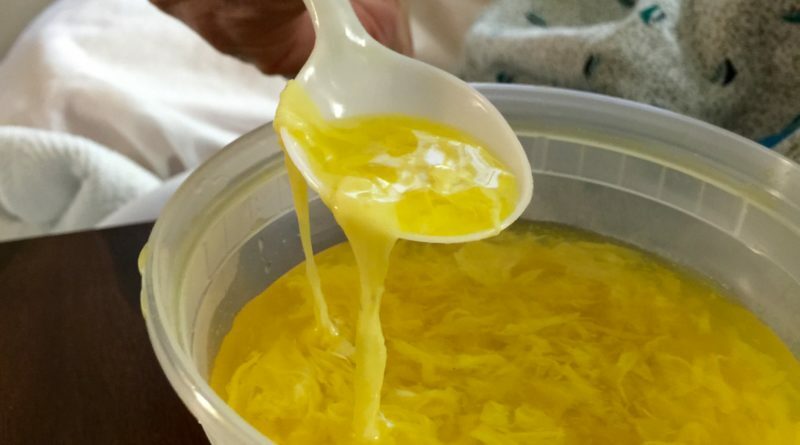 Tonight while I watched Aunt M slowly slurp spoonful after spoonful of the warm egg drop soup (the color of IBS bile) she’d been wanting for 4 days, I almost vomited. Why is it bright yellow?! The sounds alone were enough to give me pause but the egg … drops? looked like phlegm sliding off her spoon. I had to leave the room. Once I talked my gagger off the ledge I went back in and occupied myself with making a list of things to pack and take to the rehab tomorrow. And sat at the end of the bed neither watching nor listening to her eat; simply being with her. And then she had a coughing spell. Which lead to a throat clearing spell. Which lead to a bit of gagging. Which lead to… that’s right. The soup came back up. And I felt like a jerk for being bothered earlier. I got her cleaned up and settled back in bed and tossed the rest of the soup (but not my cookies) and spent a moment being grateful she was well enough to be moved from the hospital to the rehab today. Tomorrow is a new day and I’ll help her with a shower, bring the comforts of home she requested and take her on a tour of her temporary digs. Might be a short stay; they don’t have MSNBC and she’s not going to skip Rachel Maddow two full weeks, I can tell you that. When I start tweeting bad poems about soup, it’s time to call it a day. Or night. Your soup looks like snot.